I researched my fishing logs from 2008 and 2009 to see what sort of success I experienced on the Colorado River around the middle of August. I was encouraged to discover several outings with good BWO hatches and some PMD hatches late in the afternoon or in the evening. I checked with Dan, and he was available to fish on Saturday, so Jane and I planned a weekend camping trip that included a day of fishing on the Colorado for Dan and me. We packed the van with all our essential camping gear on Monday before the movers boxed up all our belongings. We suffered through a stressful week of false starts on closing for our new home, so we welcomed the getaway camping weekend. Jane and I finally successfully closed on our new house on Friday, so we loaded a few remaining items and went to the supermarket to buy food for the weekend. 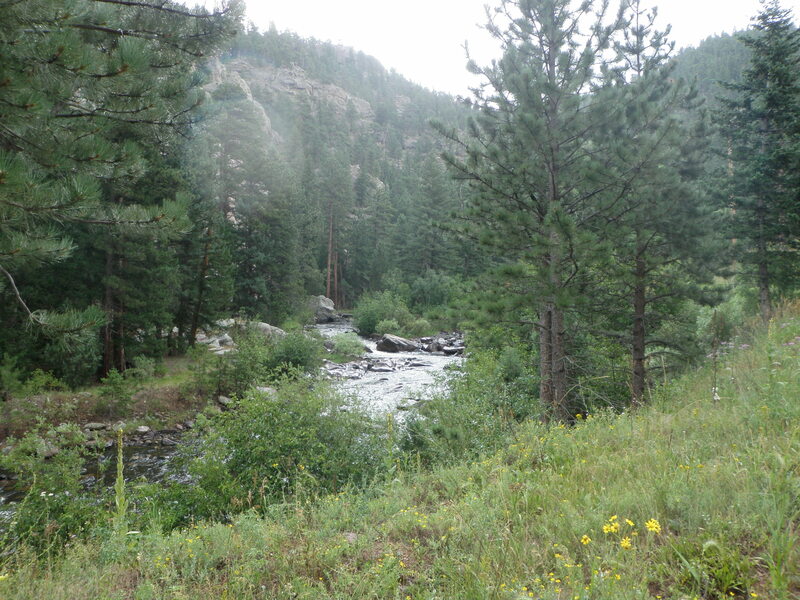 We departed for the mountains and targeted a pair of campgrounds on Colorado 125 northwest of Granby, Sawmill Gulch and Denver Creek. We stopped in Winter Park at a deli and picked up sandwiches. 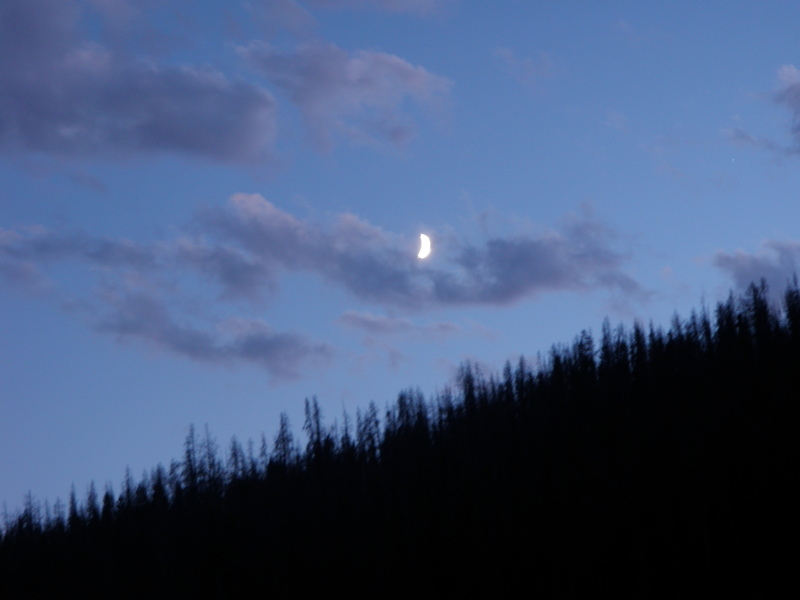 When we arrived at Sawmill Gulch, we cruised the campground and found no openings, so we moved on north for another three miles to Denver Creek. Here we discovered most of the trees had died from the pine beetles and had been sawed down to prevent injury from blow downs. There was a circle of camp sites on the east side of the highway, and then another on the west side next to Willow Creek. We chose the Willow Creek side and set up the tent and ate our deli sandwiches. Dan arrived at around 8:30 after the sun had set and the temperature dove significantly. 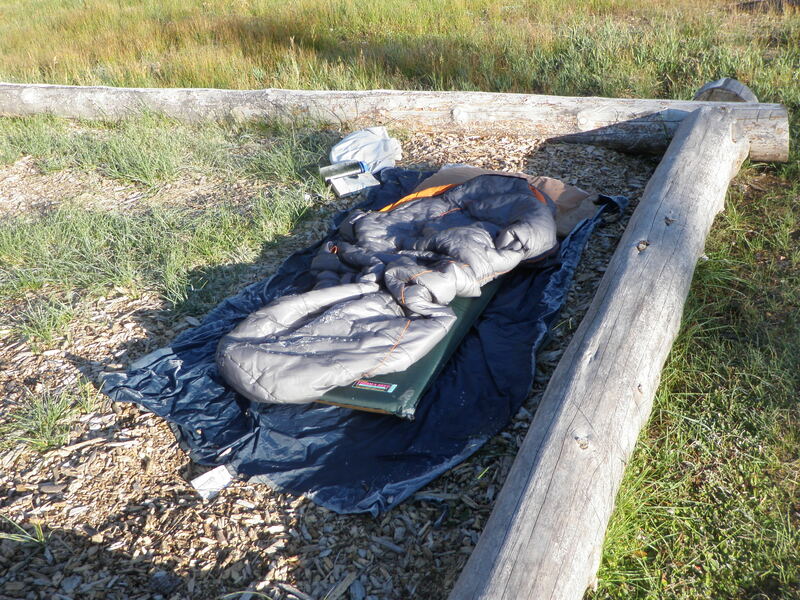 Dan decided to sleep under the stars on the camp pad that wasn’t being used. When we awoke on Saturday morning, it was cold with thick frost covering the picnic table, the stove, and Dan’s sleeping bag. Dan admitted he was quite chilly during the night and didn’t sleep that well. We made some hot tea and waited for the sun to rise above the hill to the east. Fortunately we chose a site that didn’t contain many trees and the solar energy of the sun warmed things up quickly. 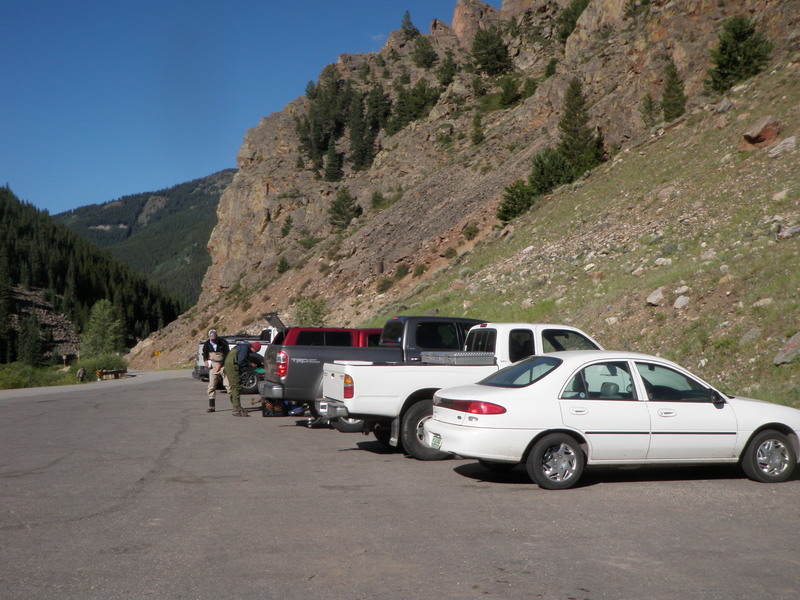 After we’d eaten and cleaned up, we took a drive north on CO 125 to the top of Willow Creek Pass to explore for hiking trails that Jane could use while Dan and I fished. 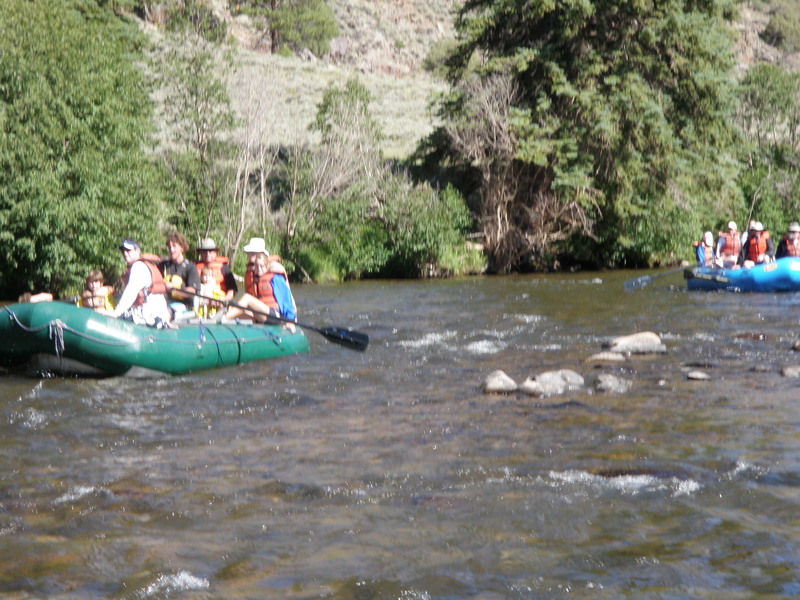 We returned to the campground and made lunches and took off for the Colorado River. 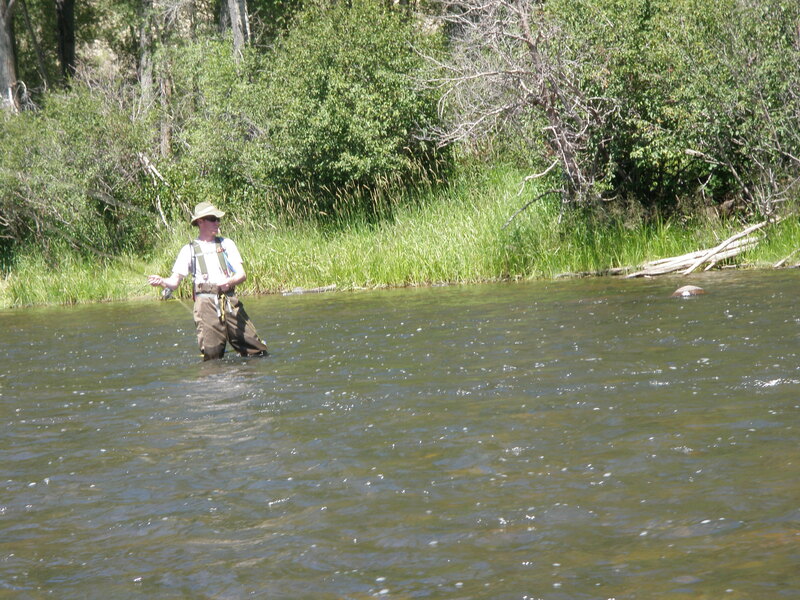 By the time we drove to the Breeze access and geared up and walked to the river to begin fishing it was around 11:30AM. The sun was out and the sky was a brilliant shade of blue. I was concerned that the fishing would be slow, but hung my hopes on the reports of late afternoon hatches. 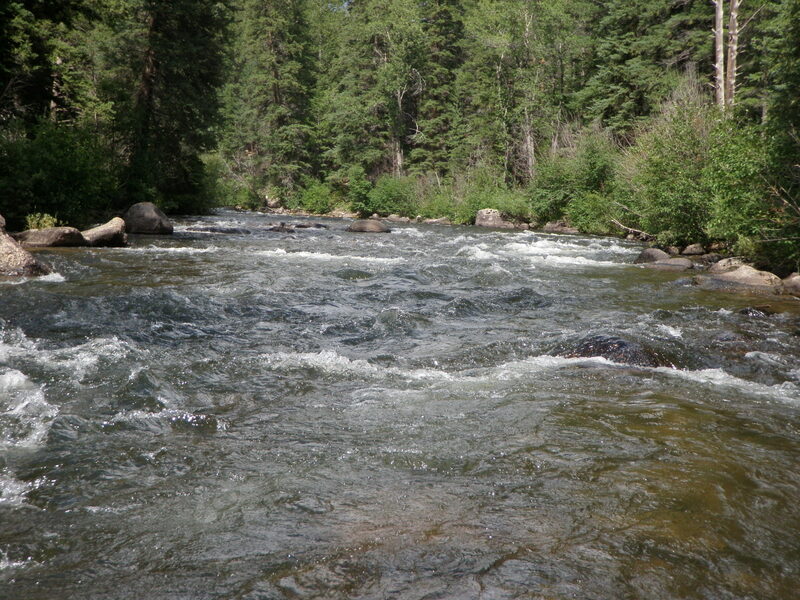 We initially hiked toward the pool with the strong center current, but when we got close and entered the river, there were two pairs of fishermen ahead of use. We reversed course and hiked back down the north side of the river. 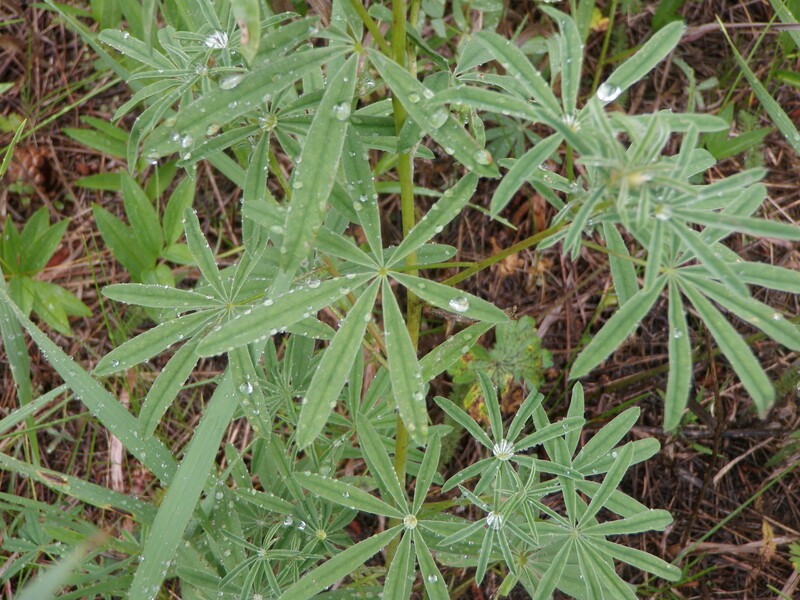 Of course the mosquitoes were fearsome, and we stopped to lather up with repellant. We walked down the path on the north bank to a point where we could cut to the nice riffle area at the head of the long pool. 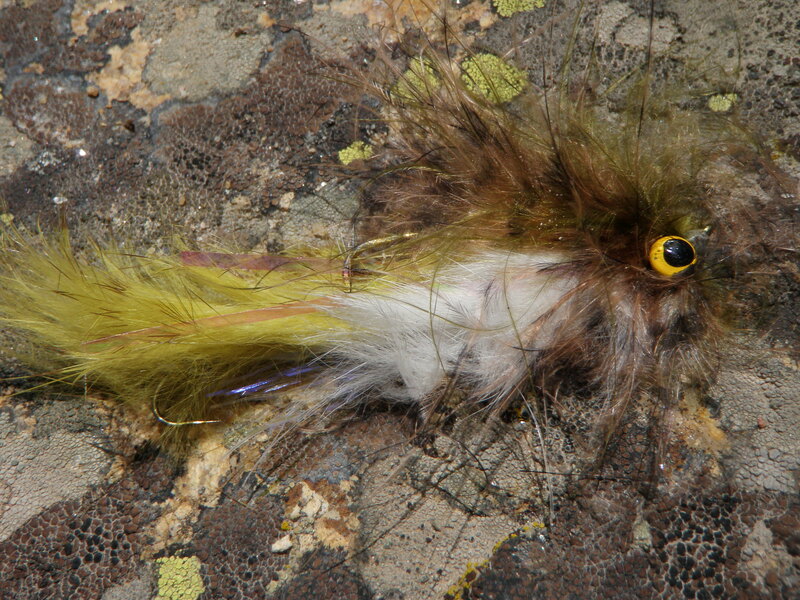 I tied on a yellow Letort hopper and a beadhead hares ear. I used a Letort hopper as well, but added a trailing beadhead pheasant tail. Dan worked the left side and I paralleled him from around thirty feet out in the center of the river. 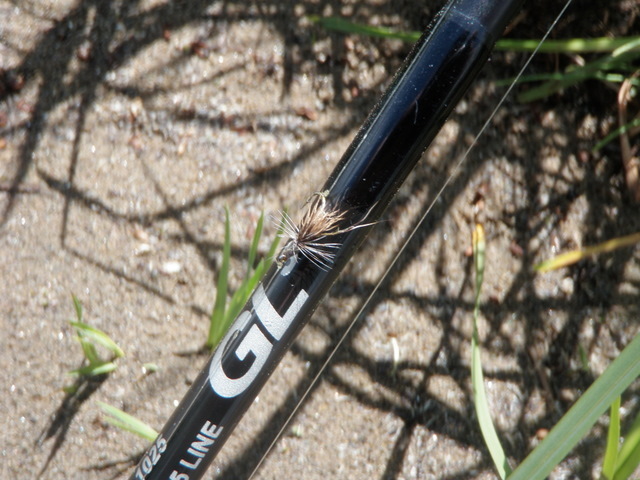 After advancing a few feet, Dan spotted a rise to his hopper and set the hook, but snapped off both flies. Maybe the day wouldn’t be so bad. I worked upstream with no success and eventually switched from the beadhead pheasant tail to a light gray size 16 deer hair caddis. Towards the top of the riffles, a trout sipped the caddis, but I also broke off the fly when I set the hook. We both exhausted the attractive riffle water so decided to wade to the south bank and stash our rods and eat lunch on a large wide rock to avoid the mosquito swarm. After lunch we crossed back to the north side and hiked down the path to the top of the island. We crossed to the point of the island then hiked down the north side to the bottom. We began working up the right channel facing upstream where Jeff Shafer landed a 20 inch rainbow a year ago. Dan saw two refusals, but I had no luck whatsoever. When we moved to the top of the south braid, we waded to the bottom section of the long pool along the south bank. Here I observed some subtle rises. By this time there were some scattered puffy white clouds in the sky, and when the sky ducked behind them, the wind would kick up. I had Dan try for the trout that had risen first. The rise showed a couple feet from the bank in shallow water no more than a foot or so deep. I tied a parachute black ant on behind Dan’s hopper. Dan placed some nice casts over the spot of the rise, but couldn’t coax a rise. While Dan was casting to this fish, I spotted another subtle rise higher up in the glassy smooth tail of the pool. I added a parachute ant to my hopper as well, and took my turn on the fish higher up. On the third drift, a decent 13 inch brown darted to the surface and sipped my ant. We moved on and again spotted a few subtle rises. Again Dan took first shot and cast from below. I suggested that Dan check his cast high so the flies would gently flutter down to the surface with less immediate drag. He did this in expert fashion, but still couldn’t draw a response. After ten casts or so, I tried for the same fish from the side, and the small brown darted up and grabbed my ant. I can’t explain it other than the fact that I was casting from the side and the fish didn’t see any line; whereas, the line was in view when Dan cast from directly downstream. We continued working our way up along the right bank a bit. I spotted a rise in front of me no more than eight feet away. Dan was to my right and below me another five feet or so and he popped a cast above the spot of the rise. I watched as a small brown darted to the surface and gobbled Dan’s hopper. Dan made a soft hook set; perhaps overreacting to snapping off flies at the beginning of the outing, and hooked the fish for a few seconds only to have the fish break free. We moved up along the bank some more, but didn’t spot any more rises. It was now around 5PM and the sky was once again devoid of clouds, and the air remained quite warm. Dan and I retreated to a log at the top of the island and sat down and observed the water for a half hour. By 5:45 nothing had changed and the sky continued to be cloudless, so we decided to return to the campground to prepare dinner. Perhaps there was some late activity before darkness, but we didn’t wait to find out. With an additional day to fish now that I was sure Jane would not make the trip, I decided to explore. I was intrigued by Texas Creek after reading a brochure covering tributaries to the Taylor ten years ago. The fly shop recommended the Upper Taylor, so that was another interesting choice beyond Texas Creek. I set out nice and early Saturday morning and stopped at the Hog Trough, the public stretch of the Taylor below the dam, and snapped some photos. I then stopped by the marina and took a photo of the lake and gorgeous backdrop and called Jane from one of the few locations within the cell phone network. Next I crossed Texas Creek as I made my way around the lake. It appeared to be a decent volume of water, so I turned on to Texas Creek road. The two miles on the rough dirt road turned out to be quite a challenge in the old Sienna, but I made it to the intersection with the creek without incident. I geared up and grabbed my rod and started working my way up the creek. Texas Creek was largely wide and shallow with very few fish holding spots. In addition there were maverick campsites all along the way and a small army of dirt bikes and ATV’s in the area. I can only imagine ATV fishermen tossing bait into the few fish holding spots and then stringers of small trout feeding the nearby campers. After an hour of mostly wading and walking, I decided to abandon Texas Creek and head to option two, the Upper Taylor River. I carefully maneuvered the rough dirt road back to the dirt road the skirts the lake and drove beyond the inlet two or three miles. At the first rough spur that wasn’t occupied by campers, I turned in and parked and retrieved my lunch. By the time I was ready to fish it was around noon and the sky had become quite gray with bigger clouds forming in the west. 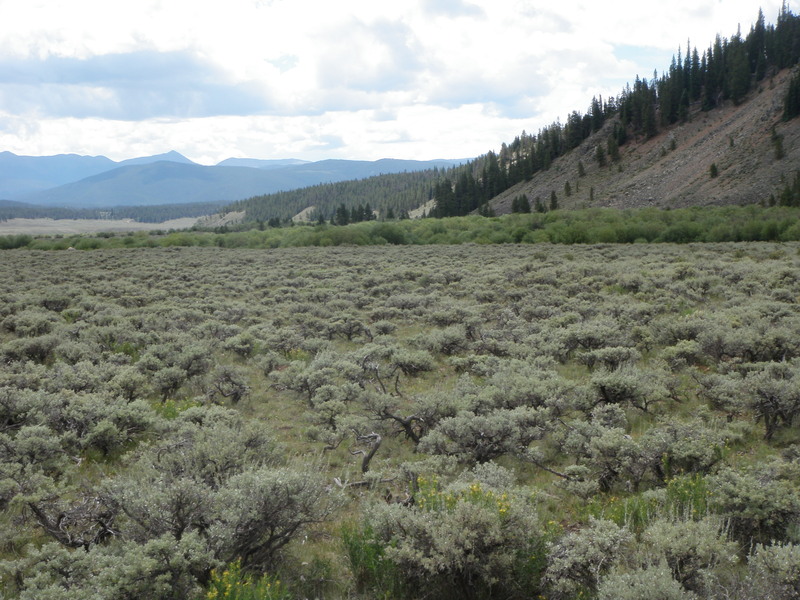 I decided to hike south a ways in the sagebrush then cut over through the willows to the river. 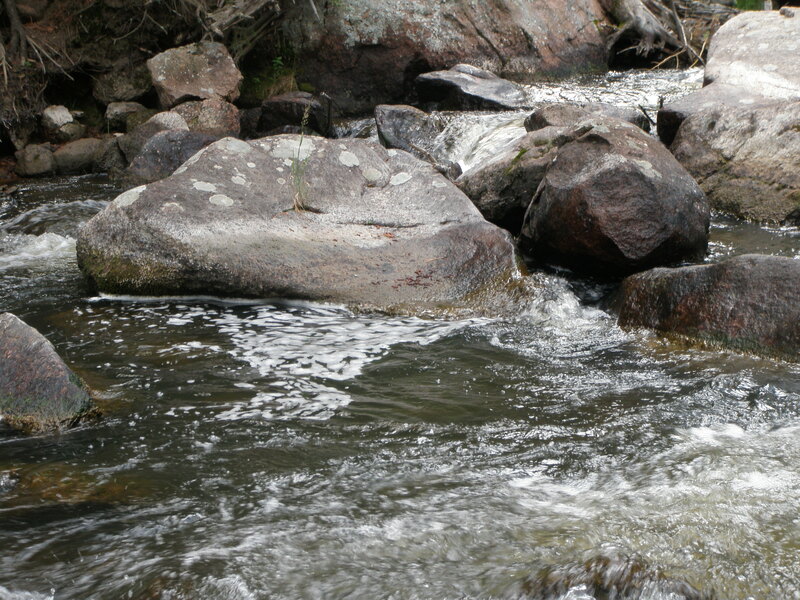 When I reached the stream it was beautiful with many rocks and tumbling pockets and runs and ice cold clear water. 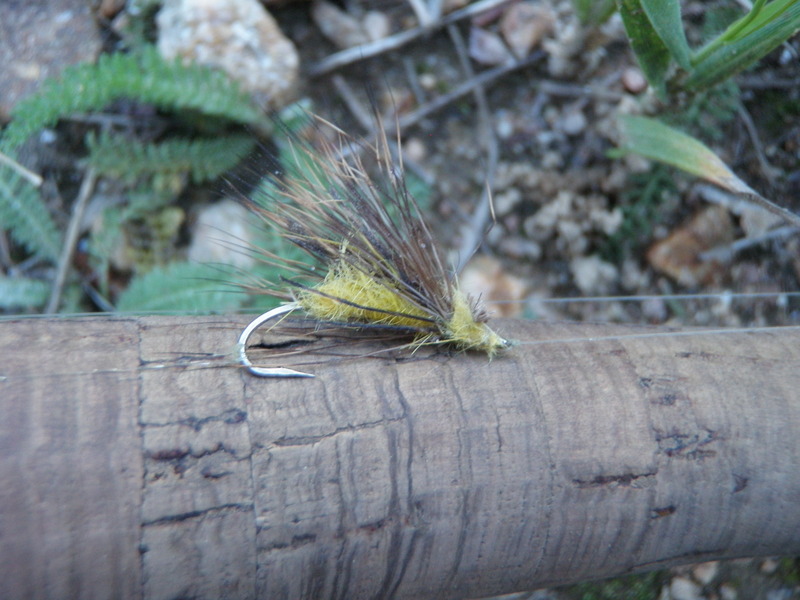 I had the yellow Letort hopper as my top fly and a beadhead hares ear nymph as a dropper. 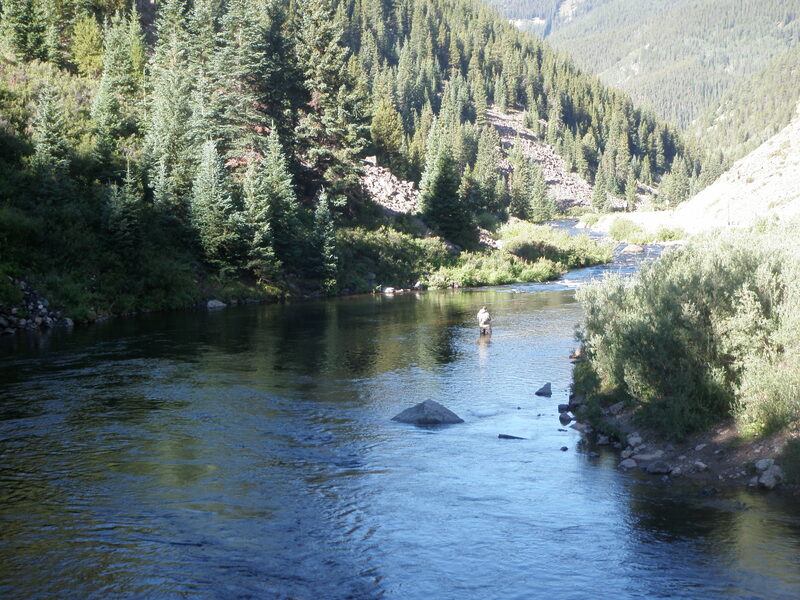 I began casting to the deep runs and pockets and almost instantly began hooking fish. This was almost too good to be true. The next hour provided red hot fishing as I hooked and landed 10 brown trout, and these were not all small fish. 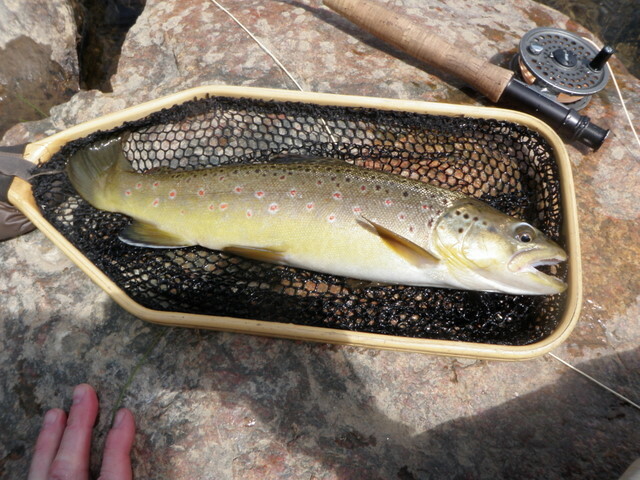 Several browns were in the 12-13 inch range and one very memorable fish stretched the length of my net. This upper Taylor bruiser rose up and hammered the hopper with confidence in a deep cold slot between two strong currents. Of the ten landed in the first hour, half smashed the hopper and the other half grabbed the nymph. After the first hour; however, the action slowed considerably. I don’t know if this reflected the time of day or heavier fishing pressure. I ran into another fisherman after an hour and worked around him and noticed the path on the bank was more worn from heavier use. I’m guessing heavier fishing pressure is the answer as the sky remained cloudy and in fact I had to put on my rain jacket due to a slight shower and chilly temperatures. Unfortunately I expected a hatch of some sort, but only saw a handful of small BWO’s and perhaps two PMD’s and no surface feeding. 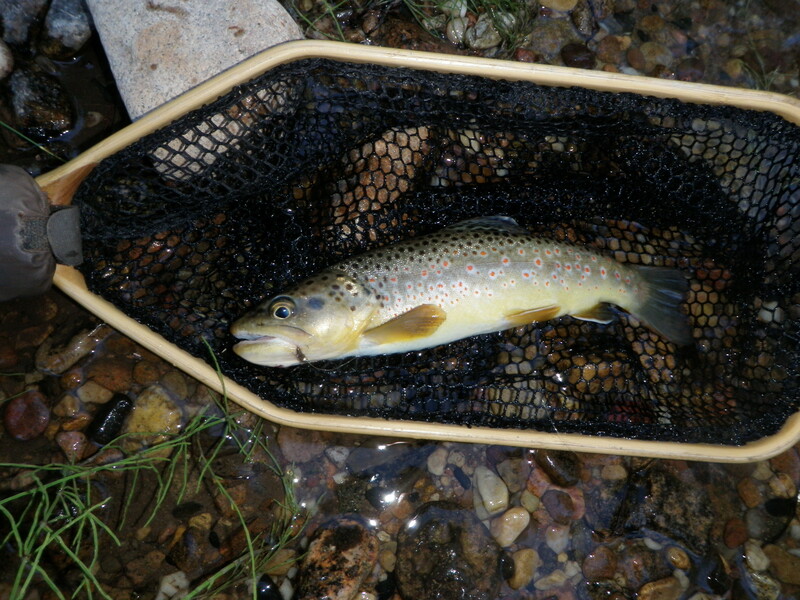 I fished on upstream covering a lot of water with many prospecting casts and picked up another three browns. Eventually I reached a single lane dirt bike or pedestrian bridge. Below the bridge was a beautiful long pool. I was skeptical that this would yield any fish as its accessibility probably meant heavy pressure. I had switched out the hares ear for an emerald caddis pupa and added a beadhead pheasant tail as a third option at the point. I half heartedly tossed the three fly combo into the pool on the far side of a current seam and as it started to swing at the end of the long drift, a trout grabbed the BHPT. I landed a nice 12 inch brown. Next I noticed a subtle rise across and downstream from my position. I swung the three flies near the sighting, but received no response. I clipped off the three flies and tied on a CDC BWO and put some nice drifts over the spot of the rise. I still had no response. Finally I removed the CDC BWO and tied on a light gray comparadun. This also didn’t solve the riddle, so I departed and hiked back on the dirt bike trail to the car. 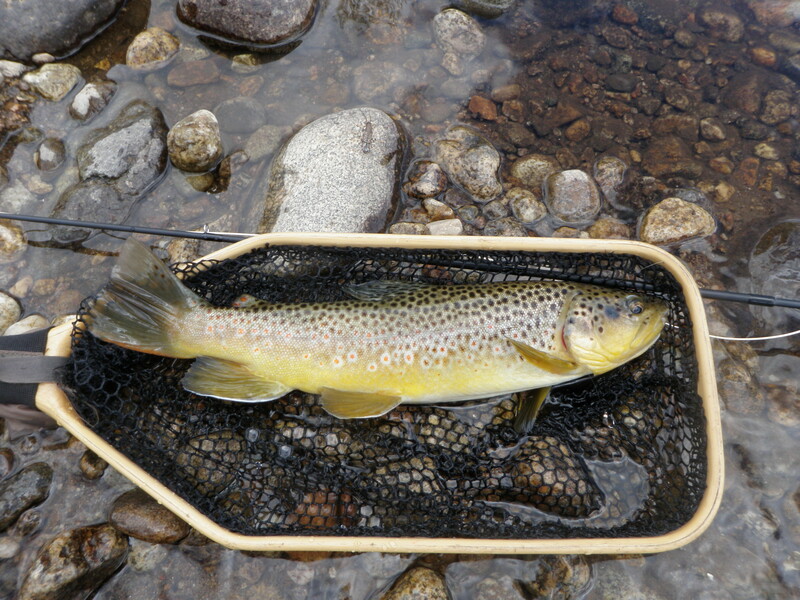 With the skies very dark and threatening, could BWO’s be emerging on the Taylor River tailwater? I decided to drive back down the valley to the Five Mile Bridge where Jeff Shafer and I had fished and check out the water below the bridge. I arrived around 4:30PM, but the weather here differed greatly from the upper Taylor. Skies were mostly blue and the sun was out. I sat on a rock by the river and observed. Nothing was showing, so I decided to prospect the nice deep run below the bridge with the light gray comparadun. This didn’t prompt any action, and I didn’t see any surface activity, so I recalled the words of the fly shop, “Go deep with small nymphs”. I sat down on the rock again and added a strike indicator and split shot and beadhead pheasant tail and beadhead RS2. I worked the deep slot between some large submerged rocks below the bridge with the nymphs and hooked up momentarily on a single fish. I moved above the bridge and worked my way up along the right bank with the nymphs to a point across from the boat launch. At 5:30 I was tired and not having any success, so I decided to call it quits for the day and head to the Three Rivers Restaurant in Almont for a BBQ dinner. The fly shop had informed me that the river was dead from 3-6PM, and it didn’t look like any significant cloud cover was going to materialize on Friday afternoon. I was aching for some larger fish, but more importantly I was anxious for more consistent action. I drove slowly along the dirt road that borders Spring Creek after turning away from the Taylor River at Hamel Resort. 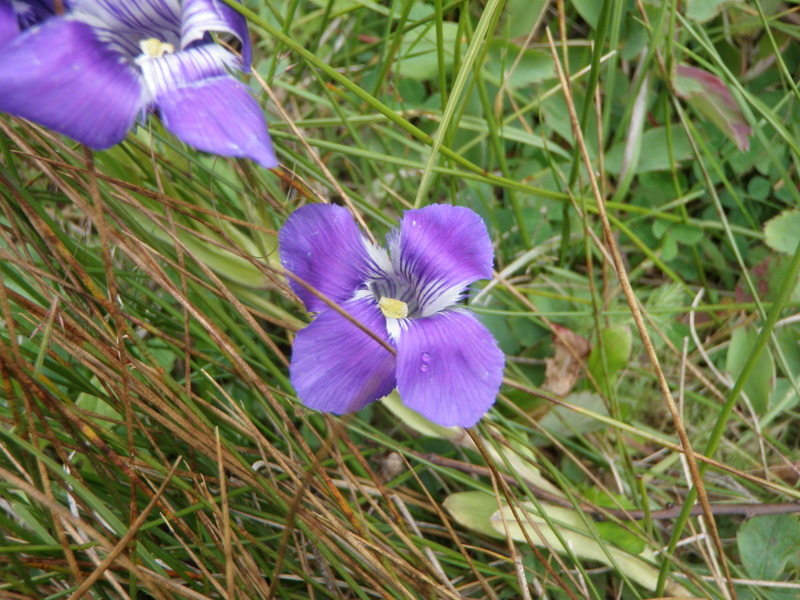 The fly shop salesman had mentioned a meadow stretch where the stream meanders and contains numerous undercut banks. Approximately five miles up the dirt road I encountered the area the salesman described. There were several fishermen and cars parked at the southern border to this area so I drove on to the northern edge. I found a small pullout and parked and scrambled down the bank to the stream where I ate my lunch. The stream was shallow here, but I could see a nice deep hole along a high bank below me. After finishing my lunch, I waded across a shallow stretch and circled down below the deep hole. I still had the Chernobyl and BHHE attached to my line, and on one of my casts tight to a log that ran parallel to the high bank, experienced a momentary hook up on the BHHE. Because there were fishermen downstream I moved upstream and as I progressed the stream grew narrower and more resembled a Colorado headwater stream. Also the sky clouded up somewhat as the sun popped in and out of cloud cover. I was getting refusals to the Chernobyl, so I switched to a yellow Letort hopper but kept the BHHE. This combination worked well, and I got in a nice groove over the next three hours, dead time on the Taylor, and landed 14 browns. I’d guess the flies yielded equally resulting in a 50/50 mix of hopper vs. BHHE. The fish were mostly in the 7-9 inch range, but it felt good to have some success and catch fish from spots where one expected to find fish. 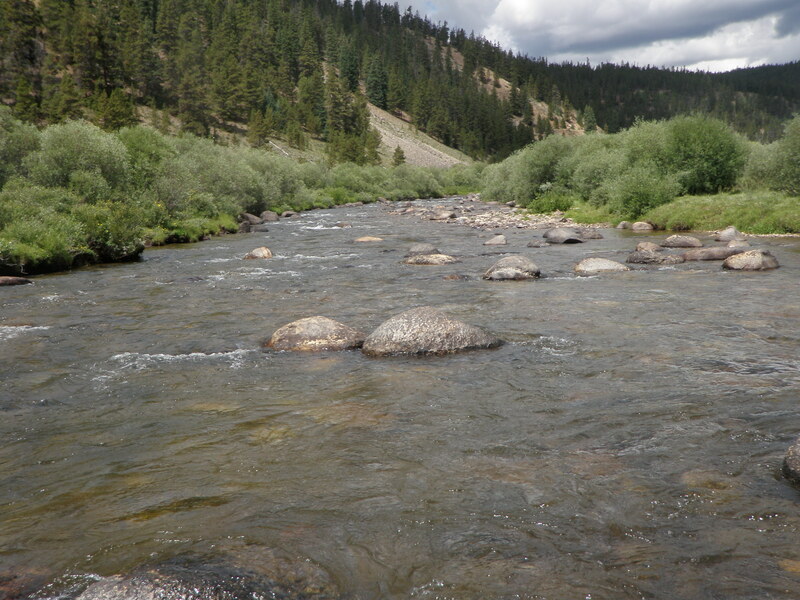 Much of the fishing was casting a short line directly upstream with only of couple feet of fly line beyond the tip of the rod, and then holding the rod high as the flies drifted back through small pockets and slots behind boulders. 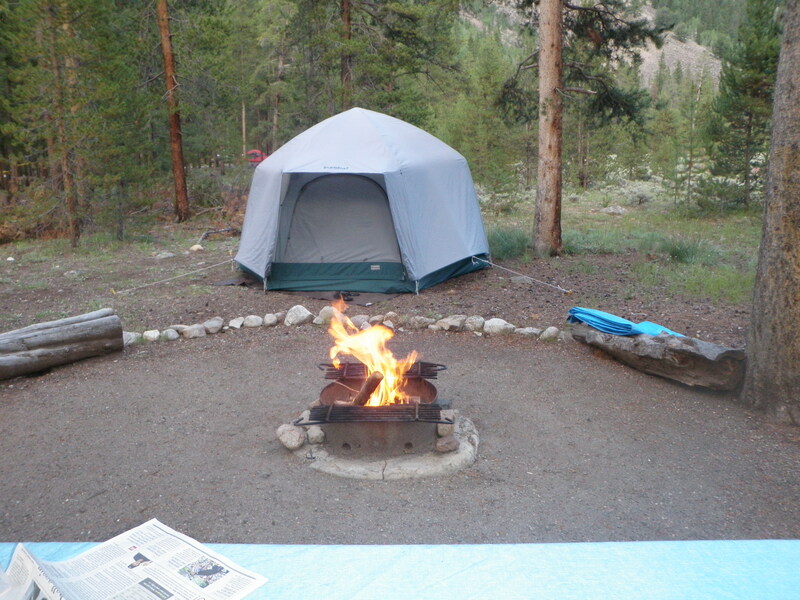 Jane and I planned a camping trip to the Taylor River area for the first weekend in August. I expected to make the four hour drive on Thursday morning and snag a campsite at one of the many campgrounds along the Taylor before the weekend crowds arrived. Jane would leave work early on Friday and join me Friday evening. It never worked out that way. 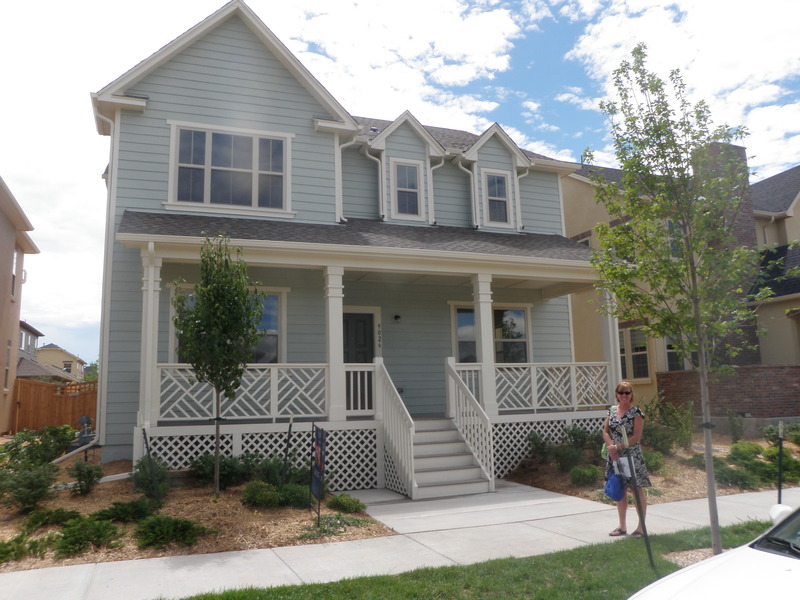 Jane needed to stay in Denver in case something came up on the new home purchase as we were trying to close on Monday. I got off to an early start with the car packed and on the road by 8AM. 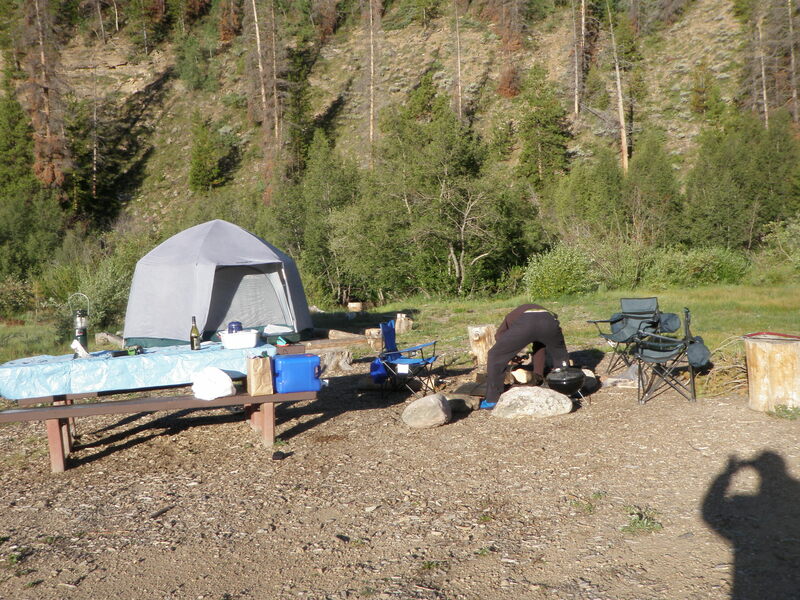 The first campground is Lottis Creek, and I made a loop through the first area, and noticed more than half of the sites were open and available. I really preferred the Lodgepole Campground, so I decided to cruise down the road another three miles to see if anything was available there. I noticed one nice campsite among the lodgepole pines with an open placard, so decided to snag this one. 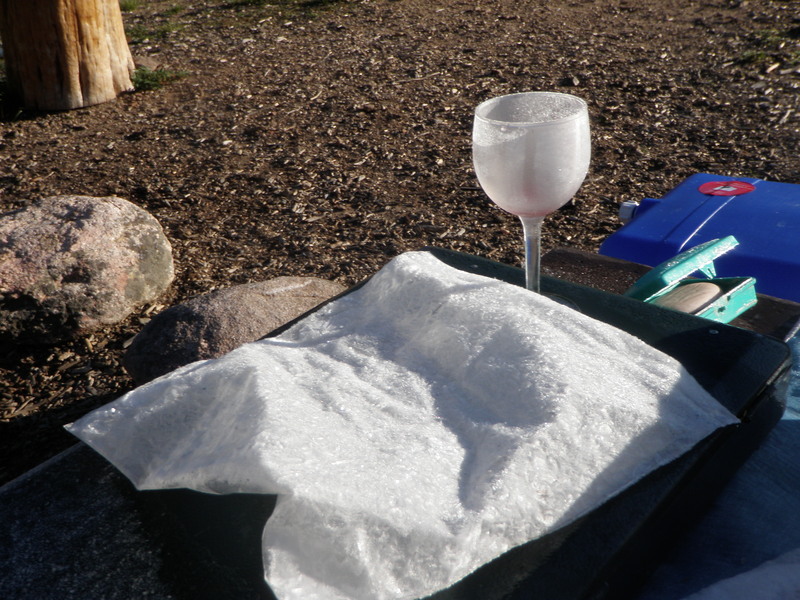 I unloaded the containers and cooler and put a tablecloth on the picnic table. 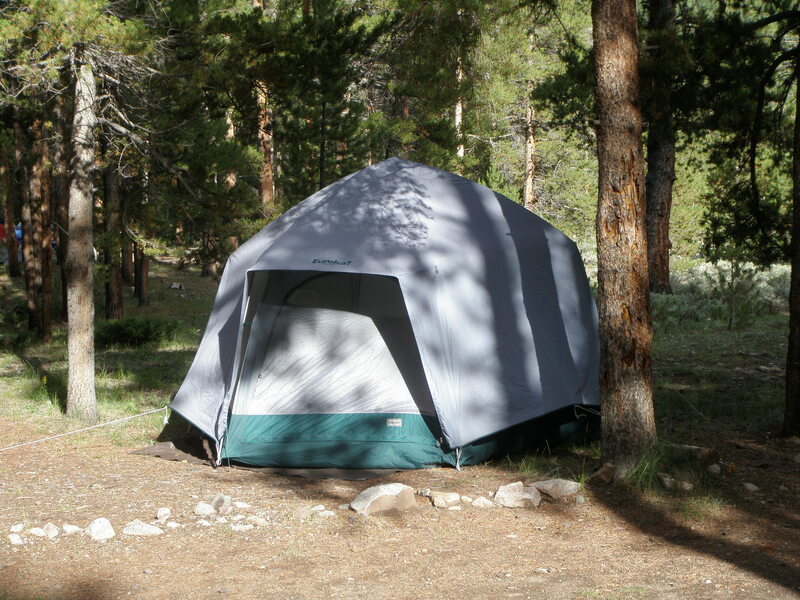 I started assembling the tent and was staking out the rain fly when the campground host arrived. She chatted with me a bit about the heavy rain received recently, but when I asked her if I paid her, she looked puzzled. She assumed I’d reserved the site and she was putting out reserved placards. Bottom line was I needed to move because the site had been reserved. I was pretty furious and started pulling out the stakes from the tent and loading the containers back in the car. The campground host was apologetic and eventually offered me some free firewood. I decided to return to Lottis Creek and snag one of the sites I’d seen there. I put up my tent for the second time and ate my lunch. I’d lost around an hour of fishing time due to the campsite snafu. Finally I drove down the highway and stopped at a pullout approximately .5 miles upstream from the parking lot across from Lodgepole. I tied on a Chernobyl ant and trailed a beadhead hares ear. 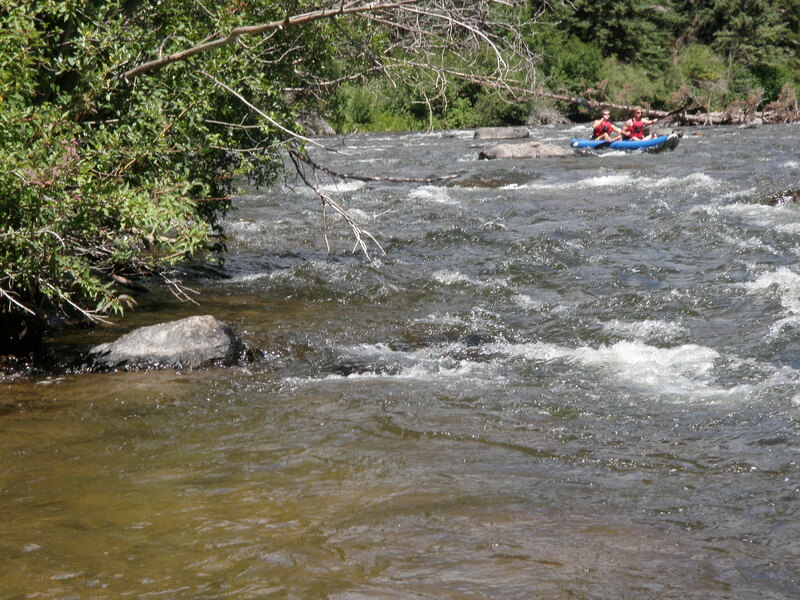 This produced on the St. Vrain, so why not here? The river was still on the high side and didn’t offer any decent places to cross and fish the north bank, so I made do with backhand casts on the bank next to the road. I worked my way upstream quite a ways and land five small brown trout on the BHHE. It was a pretty warm day with bright blue skies. I was doing a lot of casting for a few small fish, so decided to move downstream and try another location. As I drove along the river, I came to a boat launch parking area just beyond a private stretch of river. I decided to give this a chance as I could go upstream from the launch and avoid rafts. I caught two more small browns using the same flies, but it was quite slow. At around five o’clock, I called it a day and decided to drive to Almont and visit the fly shop there and buy some floatant. When I entered the young salesman showed me the floatant options, and then I began peppering him with questions about the river. While doing this, two more young gentlemen arrived that worked for the store, and they chimed in. They said the fishing was very slow from 3-6, and you had to go deep with small nymphs. They suggested trying the evening using a golden stonefly imitation on top and a caddis on the bottom and holding the fly line off the water and give the flies a dancing action. I asked about some of the smaller tributaries, and they suggested Spring Creek and the Upper Taylor as the best alternatives to the big river. The white board showed BWO’s, and they told me there were decent BWO hatches on very cloudy overcast days. Thursday evening after dinner and clean up, I drove to a stretch of open water just below the Lottis Creek campground where there are many deep pockets around large boulders. 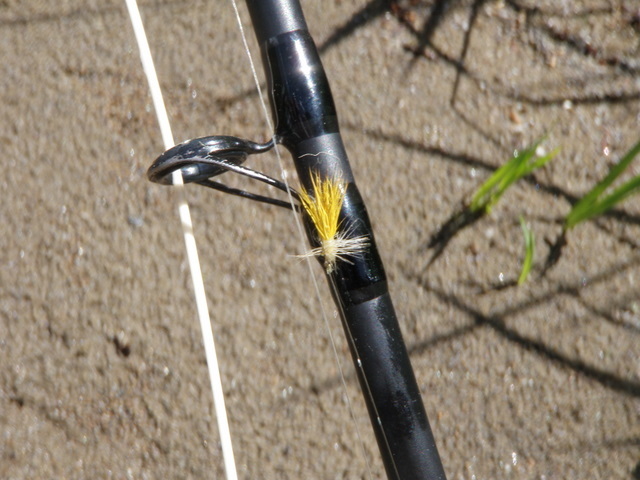 I tied on a yellow Letort hopper to imitate the golden stonefly and added an olive body deer hair caddis. I began casting the double and keeping my line off the water as suggested. I began around 8PM and ended at 8:45 when it was so dark I couldn’t see my fly. Amazingly it worked. I landed two twelve inch browns and had three or four other hits that I didn’t land. Eventually at the end of the evening I checked my caddis fly, and the hook point was bent excessively back toward the shank which may explain the failure to land quite a few trout. Epic days are few and far between. Monday classifies as an epic day. After Jane and I did a hike on Sunday, I decided to return to the same location to fish on Monday. New home commitments precluded fishing Tuesday and Wednesday, and Jane and I were planning a camping trip to the Taylor River on Thursday – Sunday. I arrived at my selected destination at around 9AM, and then hiked for a half an hour to my starting point. 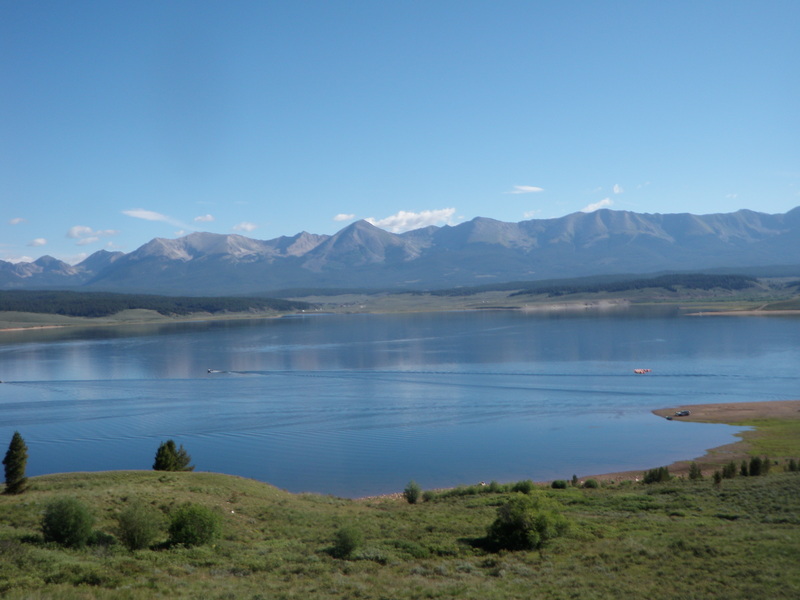 The St. Vrain at this location is fed by a dam, but the dam contains two spillways. I wanted to get above the first spillway so that I was fishing in lower volume. This turned out to be a strategic win. There was a nice deep pool right above the pipe that dumped water from the first spillway, but judging from the worn bank, I concluded the pool gets pounded by fishermen, so I moved above the pool to begin casting. 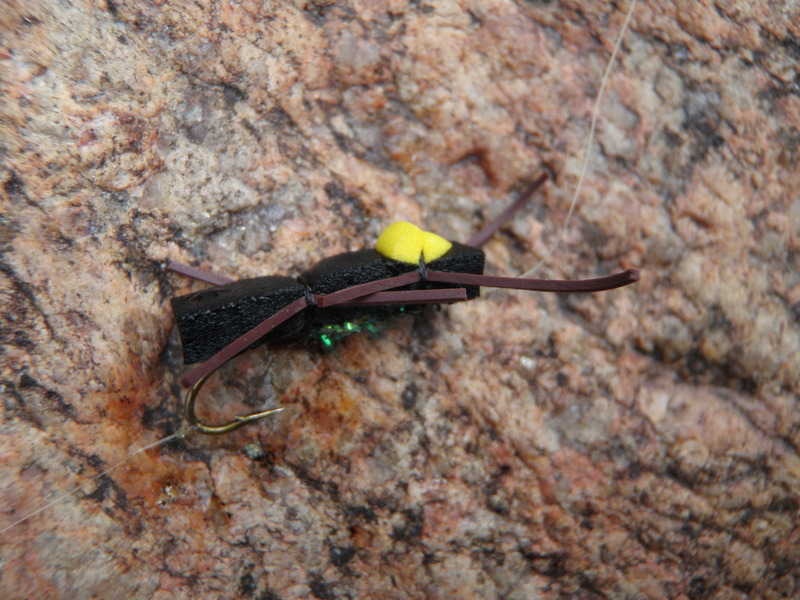 I tied on a Chernobyl Ant with no dropper to start; however, after covering the first attractive water with no response, I supplemented the Chernobyl Ant with a beadhead hares ear nymph on a three foot length of tippet tied to the bend. Fairly quickly this began to produce, and I landed some small browns. Over the next hour I landed approximately 10 small trout, mostly browns but a few rainbows mixed in. It was overcast and partly cloudy much of the morning. As the morning advanced, so did the fishing success. Between 10:30 and noon I landed another 15 trout. This hour and a half was magical with fish taking my offerings in most of the likely locations. The size of the trout improved, and I’m guessing 70% rose to take the Chernobyl Ant. Fishing the Chernobyl is great fun as the foam construction requires no backcasting to dry the fly. Some fish smacked the Chernobyl as it splashed down in the water, but the larger trout seemed to rise slowly, drift back under it, and then sip it in. This is nerve wracking to watch, but great visual fun. 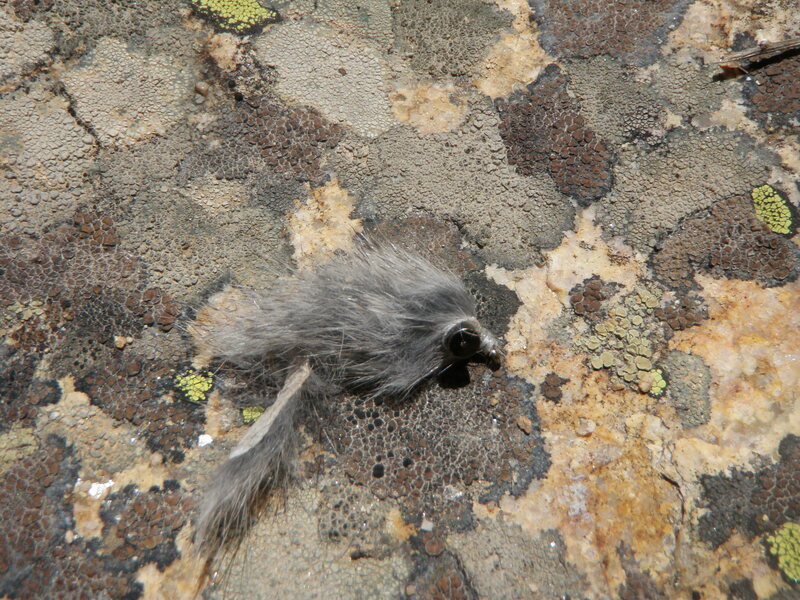 In one short deep pocket behind a rock partially covered with foam, I tossed the two fly combination and allowed it to sit for what seemed like an hour. As I went to lift and recast a 15 inch brown grabbed the trailing nymph and dashed off across and down the small stream. I landed and photographed this monster relative to its small living quarters. Eventually I approached a small cement dam and a nice pool below. There were several runs below the dam with nice seams and slower moving water in between. On one of the drifts another fish grabbed the beadhead hares ear and I carefully played it to my net. 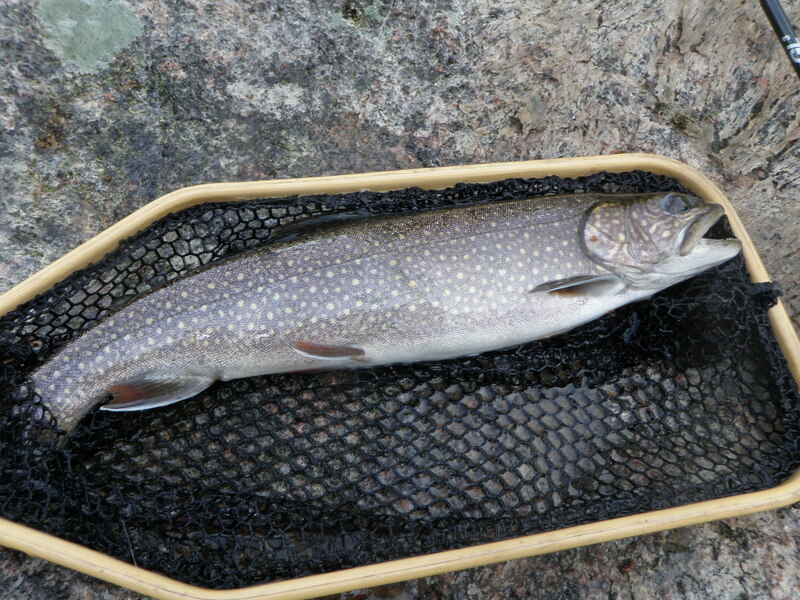 The fish was very silver in coloring as I watched it resist my pressure, and when I brought it to net I initially thought I caught the largest brook trout of my life. But it didn’t have the orange spots that I’ve grown to recognize, and I concluded I’d caught the first lake trout of my life. Perhaps it was an escapee from the reservoir above. I later caught a second laker, although this one was smaller and in the 12 inch range. The skies darkened some more and I heard occasional thunder. My fish count climbed to 31 by 1PM when I took a break to eat lunch as it began to rain. 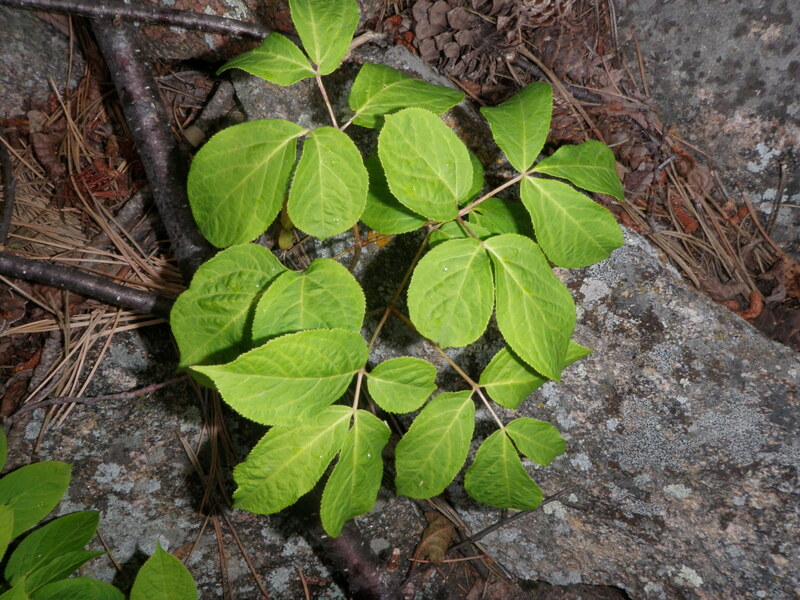 I climbed on a rock and sat under a dense evergreen while munching the lunch I’d stuffed in my backpack. After lunch I continued working my way up the stream. My first stop was another nice pool where the stream fanned out into multiple runs with current seams along the edges of the faster water. 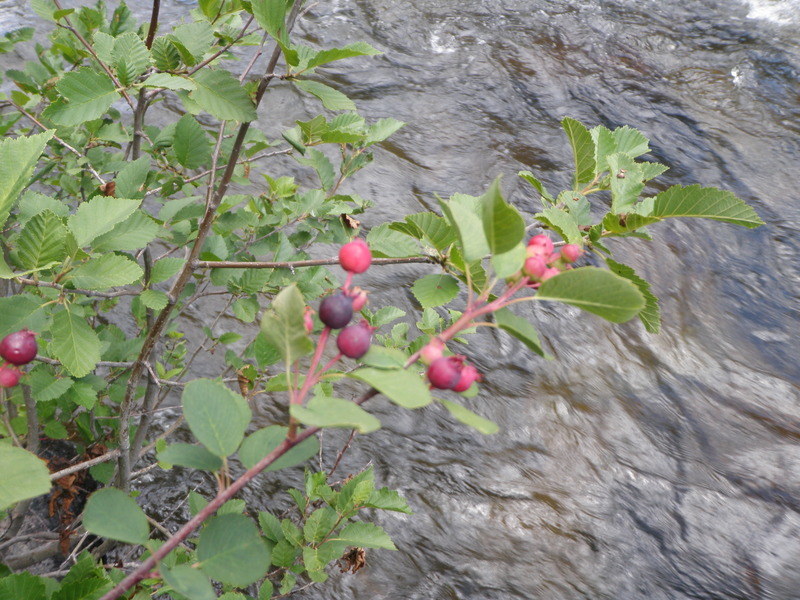 I spotted a couple rises along one of the seams near the top of the far run. I cast my double fly set up along the seams. On perhaps the fifth cast I spotted a flash to the Chernobyl and set the hook. A beautiful rainbow fought me up and down the pool before eventually succumbing to my side pressure and coming to net. This fish spanned my net from tip to handle, and I photographed it before releasing. After the tussle with the rainbow I waded upstream the remaining fifty yards until reaching the settling pool below the dam. Another fisherman was casting up into the pool in the mist created by the rain and the flume shooting from the dam. During this section of fishing I slipped on the wet rocks along the edge and fell on my knee and then shoulder. But I survived and hiked back down the road to a point halfway between the point where the stream crossed under the road and the spot where I began my fishing in the morning. I was now in much heavier flows and had to be more selective about where to cast. 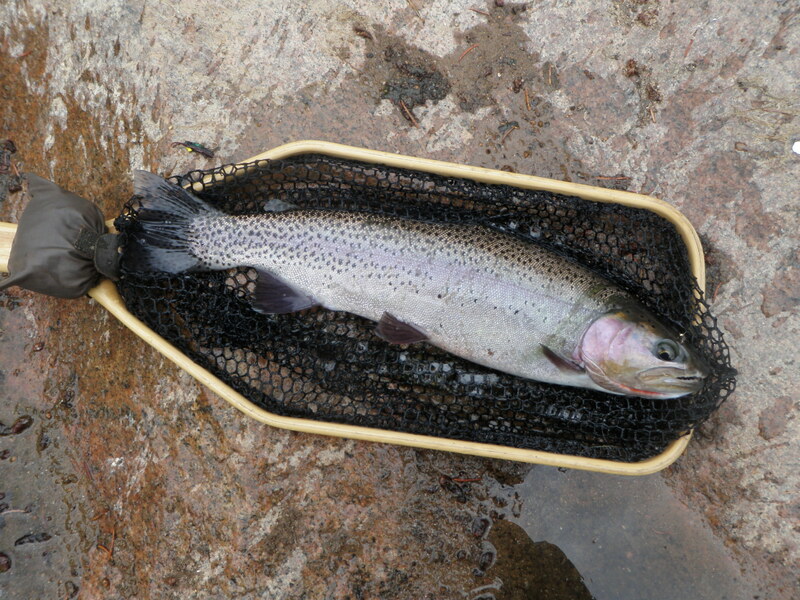 There were fewer holding areas for trout in the swift flows below the second spillway from the dam. The fishing over the remaining couple hours was much slower, and I covered much more ground between fishable locations. 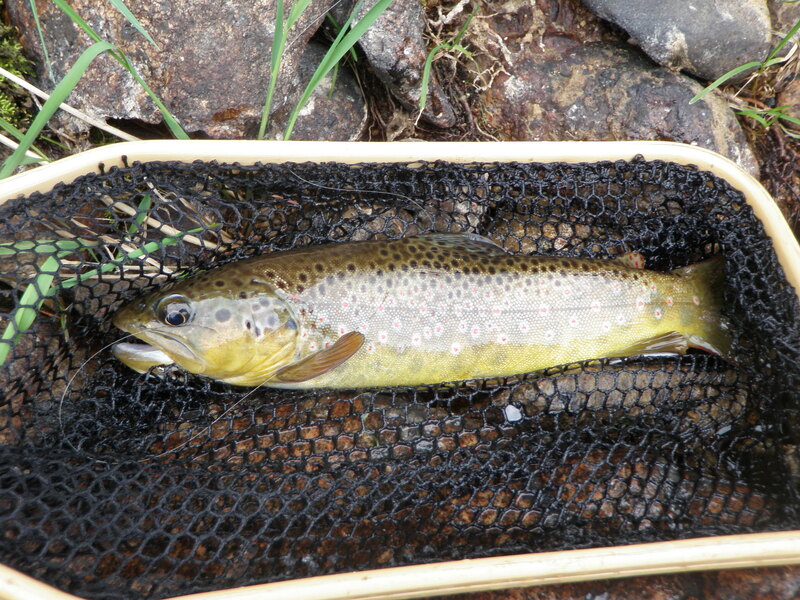 I landed another six trout, mostly small rainbows, with one decent twelve inch brown mixed in. The skies clouded up again and more thunder and lightening added to the mix. I was stuck on 39 trout when I decided to exit and hike back down the road to avoid the approaching storm. When I reached the inlet to the Longmont Reservoir near the parking lot, I noticed a few rises in the riffles just above the lake. I scrambled down the bank and waded into the stream three or four feet then clipped off the Chernobyl and hares ear and tied on a CDC BWO. I’d seen a few BWO’s emerging during the earlier rain shower. It only took a couple casts and a twelve inch rainbow tipped up and sipped in the BWO fraud. I landed the pretty bow and completed my 40 fish day as the rain showers began again. I had such great success on the Colorado River last year that I don’t want to miss any in 2010. 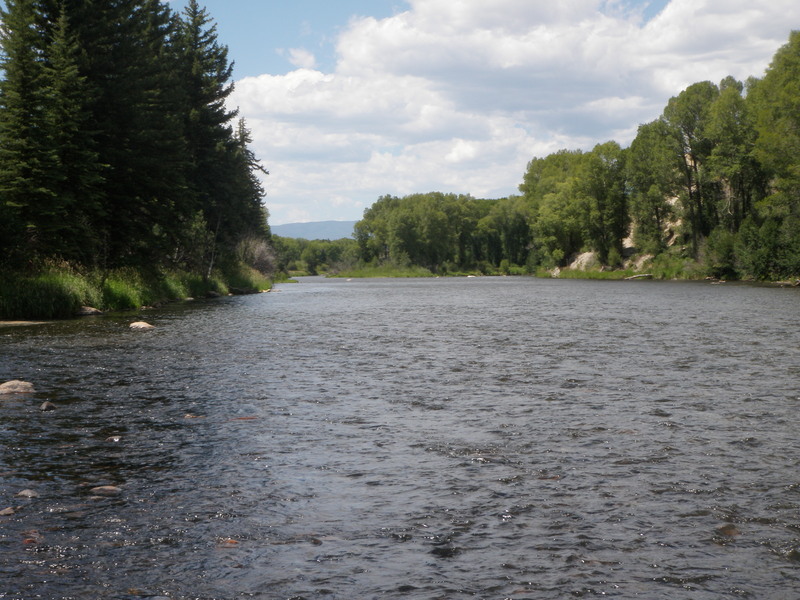 For this reason, I elected to drive two hours to the Colorado at Parshall on Thursday. A week ago I had a reasonable day, but the main PMD hatch had not kicked in yet. My notes from the previous two years told me that it was the end of July when I hit the dense PMD hatches. I arrived nice and early and was on the river by 10AM. There was only one other car in the parking lot at the Breeze access, but the mosquitoes were still present. I put my waders on to protect my legs, then lathered up with copious amounts of DEET. 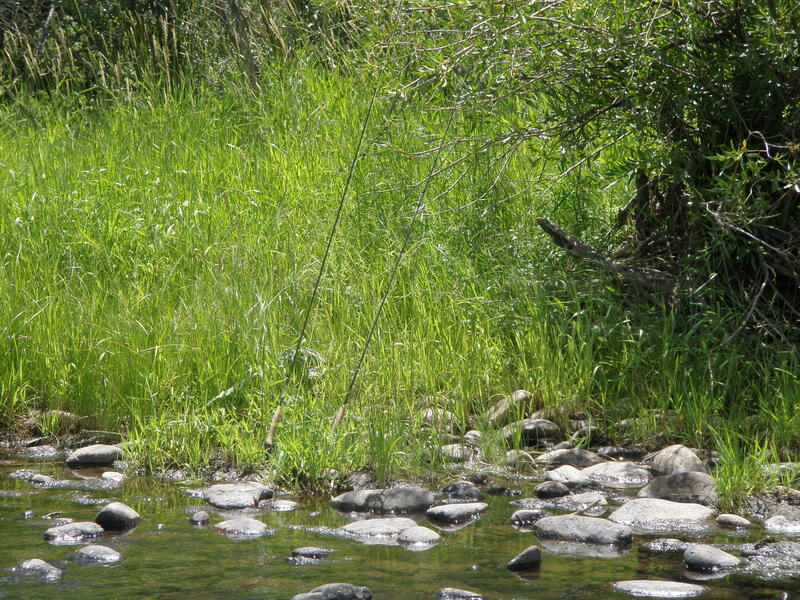 As I was gathering my fishing gear to take off for the river, I noticed a fly rod and reel lying on the ground at the edge of the parking lot near where I’d parked. It didn’t look broken and there wasn’t any identification, so I picked it up and placed it in the back of the van. I headed straight to my go to place…the long pool with a deep main current nearly down the center. This time there were no other fishermen present. I had the whole area to myself. It remained partly cloudy, but sunnier than the areas I’d driven through such as Winter Park and Fraser. 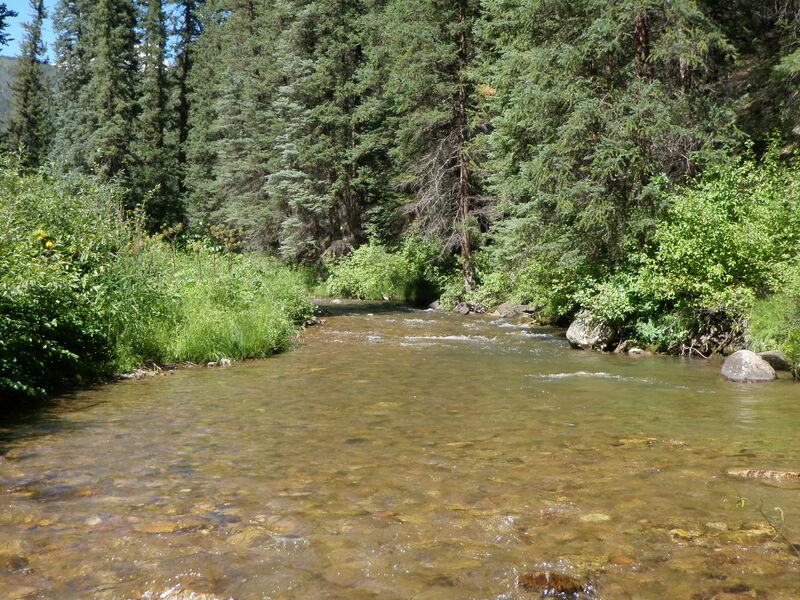 I tied on a yellow sally and light gray caddis (see photos above) and began prospecting the area roughly in the middle of the long pool where the run fanned out in a nice deep riffle. No fish were showing interest, and I didn’t see any surface activity whatsoever. I decided to rig up with an indicator and a pair of nymphs and go deep along the seam next to the strong main current. I snagged and ripped off the split shot and a pair of flies. I decided to persist and rigged up again, and this time caught a small brown 10-11 inches long. I continued fishing the entire left side of the current until I reached the top of the run, then returned to mid-pool and found a stump to sit on while I ate my lunch. I observed the water and began to see some rises, and two fish showed themselves several times. I finished my lunch and pulled the insect repellant from my backpack and lathered up once again. Could these rises be the beginning of a PMD hatch? I tied on the money fly, the light gray comparadun. After quite a bit of casting to multiple rises, a 13 inch brown sucked in the comparadun. After releasing the fish, I tried to interest the remaining sporadic risers in the comparadun, but they weren’t fooled. Perhaps fish were rising at the tail of the pool similar to the previous Thursday? I fought my way through the tall grass to the very tail of the pool and did notice a few very sporadic rises. I wasn’t seeing any PMD’s (I only saw a total of two), but did spot some yellow sallies and occasional caddis. I tied on the yellow sally/olive caddis double. 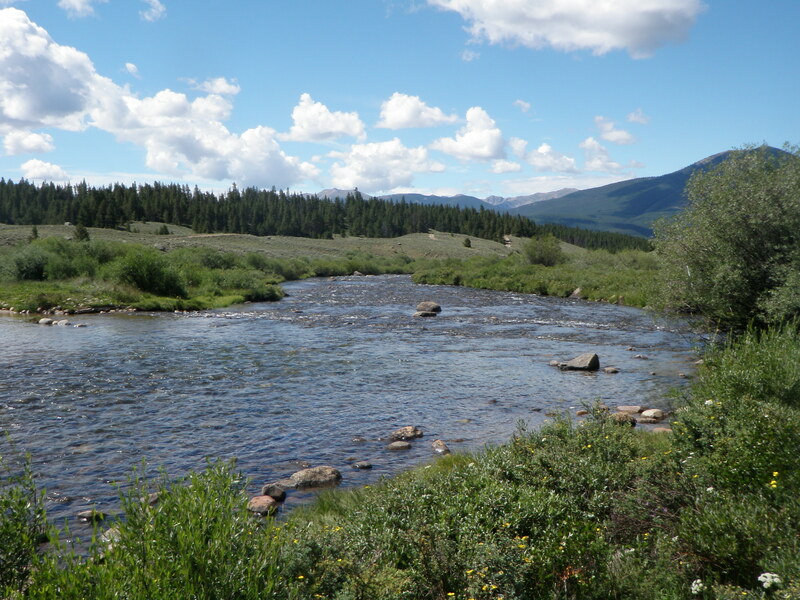 I began more or less prospecting since the rises had long ceased, and on a cast directly upstream around 10-15 feet and 5 feet out from the bank, a trout slashed at my flies. I set the hook and a strong battle ensued. I eventually landed the brown and photographed. It was quite a net-filler and extended from the tip of the net to the beginning of the handle (see photo below). Amazingly, both flies were in the large brown’s mouth. Did it take both flies or did one just work into its mouth during the battle? We’ll never know the answer to that. The brief hatch appeared to be over, and I didn’t want to go deep again, so I decided to cross the river slowly and carefully and walk up the right bank and search for telltale rises. I waded the very edge of the river on the right side to avoid going into the vegetation and create a mosquito swarm. Amazingly I didn’t spot any rises in the juicy right pool from the center current over to the bank. I waded the entire edge and prospected at a couple places without consequence. 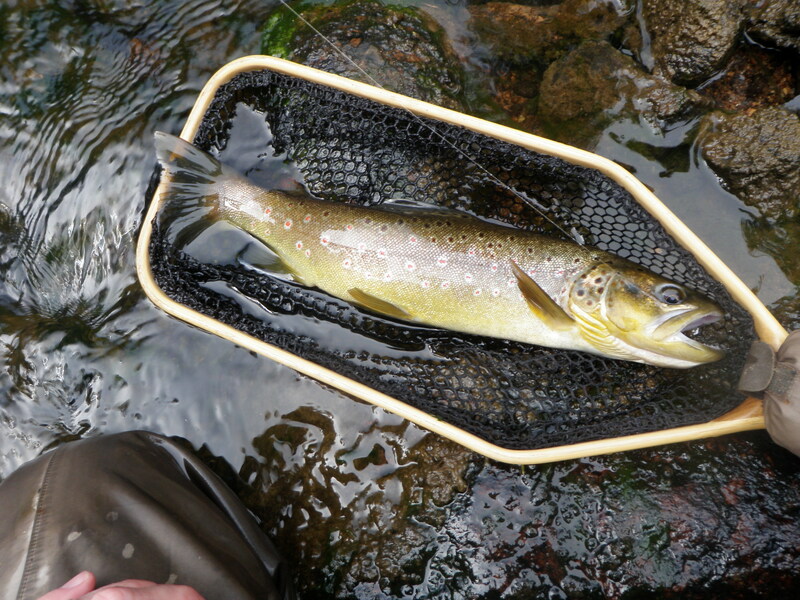 When I arrived at the head of the run, I decided to continue working my way up the river prospecting the riffles in the same manner that I’d done a week ago with the yellow sally and caddis. Once again the skies were darkening, and after I’d fished out one section of angled riffles, I waded to the shore and put on my raincoat. I continued working my way and managed to land three additional browns prospecting in this manner. Two grabbed the yellow sally and one took the caddis. When I got to the spot where I’d quit and exited to the path and then the bridge a week ago, I decided to explore the water between me and the bridge. There always seemed to be fishermen there, so I guessed it was attractive water. By now the wind was gusting and I could hear thunder but still distant. The attractive water appeared just below a small island where the wide shallow channel on my side merged with a swifter but narrower channel coming from the left. The two merged and created a nice little deeper slower area right in front of me. The skies opened and I pulled my hood up over my head and wore my western hat on top of the hood. It was effective but surely not fashionable. The rain pelted the river for three to five minutes, and I paused for part of the time. When the rain slowed to a steady shower, I noticed the swallows were working and skimming the water occasionally. I looked closely and several fish were working the water near me. One was a decent sized rainbow that cruised back and forth not more than eight feet above me occasionally sipping something. I couldn’t see any PMD’s or caddis on the water. What could they be eating? I stared at the water intently for several minutes and spotted a small mayfly spinner close to 16-18. It had a green body, not dark olive or light yellow/green, but green. I looked in my fly boxes that contain some of the flies I tied for Pennsylvania and spotted the cornuta spinners. These were actually a bit too large and bit too dark green, but I didn’t have many options. I tied one on and began casting. It was very difficult to follow the fly in the dim light among rain dimples and some broken current. I think I had a couple looks from the rainbow but no take. But on one cast when I couldn’t find my fly, I went to lift and recast and felt weight and hooked a decent brown. I landed the 13” fish and removed the cornuta spinner from the upper lip. I fished the spinner a bit longer, but as quickly as the spinner fall had commenced, it ended. The area that was alive with fish sipping spinners for fifteen minutes or so was now totally dead. The rain had now dwindled to drizzle, and I moved up closer to the junction of the currents. I went back to the yellow sally and caddis and prospected some attractive water for a bit, but found no action. I was now quite close to the bridge and feeling chilled, so I found the path and exited the river. The mosquitoes were swarming me as I crossed the bridge and hiked to the highway. I had to pause along the shoulder of route 40 and remove my backpack and apply more DEET. I debated circling back through the lot and then heading back to the river again, but decided I was quite chilled and tired. I removed the rod I’d found when I got back to the car and discovered it was an Orvis four piece 6 weight. The section holding the reel was stuck to the first section part way apart. The reel was a Reddington reel and there was nice fly line in it. I decided to take it home and see if I could separate the sections using ice like I’d done with my old Sage once before. As I drove back along the river on route 40, I looked down at the river and noticed a stream of brown water on the right side. Apparently it had stormed quite a bit somewhere and washed a bunch of sediment into the river. The decision to leave when I did was looking pretty good.